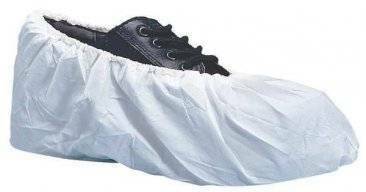 Cross linked polyethylene shoe cover that is non-particulating, extruded cross linked 100% polyethylene with heat sealed seams. Inspected for seams, sizing, material and workmanship. Seamless. One piece design protects your shoes or socks against liquids. Made from lint free polyethylene film, which is thicker than polypropylene for added protection. Packaged 100 Seamless Shoe covers per bag, 3 bags per case = 300. 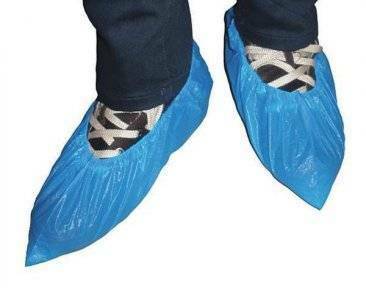 Shoe covers protect floors and increase worker safety. 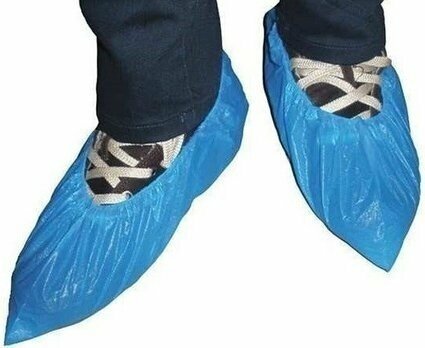 You can buy shoe covers from PalmFlex for industries such as medical, food service, plumbing and assembly. Pick the shoe covers that provide the best solution for your unique work environment, whether you need non-slip, chemical resistant or waterproof materials. You can select the materials that work best for your environment, such as polyethylene, polypropylene, latex and nylon, to name a few. Our shoe covers range in size from Small to XXL, so there's a cover to fit everyone. You'll also find an assortment of colors like blue, orange, red and yellow to suit your company's style. Our convenient online store makes purchasing shoe covers fast and easy. Buy shoe covers in bulk and take advantage of our huge volume discounts. You'll also get free shipping within the continental U.S. for orders over $80, and our 30-day return policy will allow you to buy shoe covers with no risk. Feel free to contact us if you have questions or need assistance.